“The busiest half of the year for retailers is about to begin, and with economic conditions swaying in consumers’ favor more so this year than last, many seem eager to take advantage of retailers’ promotions,” said NRF President and CEO Mathew Shay. When it comes to shopping for new Independence Day merchandise, though many already have all the patriotic gear they need, more than 48 million consumers - 22.8 percent -will hit the stores looking for decorations, apparel and more to celebrate in style. The survey found 42.6 percent, or 103 million celebrants, will attend a fireworks display or community celebration, and 11.5 percent – 27 million of those celebrating, will watch a parade. The holiday weekend is also a popular time for travel and vacations as more than 33 million Americans say they will head out of town. When asked about the impact gas prices will have on their spending, nearly eight in 10 (78 percent) say that the price of gas will not impact their spending for the holiday weekend, up from 70.1 percent who said so last year. “Consumers this summer and for the 4th of July will take advantage of lower gas prices to head to the beach or get together with family– something they’ve had to think long and hard about in recent years with higher energy costs and limited budgets,” said Prosper Insights Consumer Insights Director Pam Goodfellow. 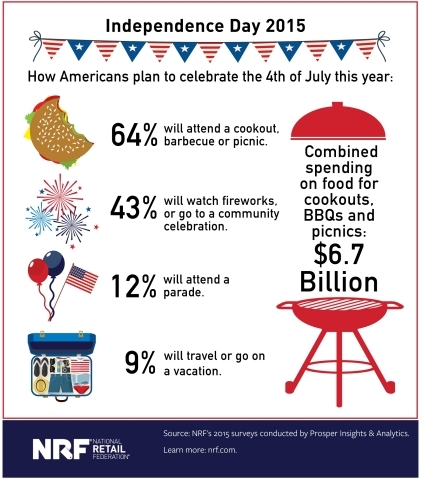 The NRF 2015 Independence Day Spending Survey was designed to gauge consumer behavior and shopping trends related to the Independence Day holiday. The survey was conducted for NRF by Prosper Insights & Analytics. The poll of 6,431 consumers was conducted from June 2-9, 2015. The consumer poll has a margin of error of plus or minus 1.2 percentage points.